I'm often asked over and over and over again, which is cheaper, to host your own wedding at home or at a venue? We will be having a series of different blogs in the upcoming months demonstrating the pros and cons to both. I'm going to start with food, because well I have a love and hate with wedding food. During wedding season my main meal of weekends tend to be wedding dinners. In my years of being a planner, I've had countless servings of chicken, most pretty typical and a few beyond horrible. One to the biggest differences is the control over what you serve and how much it will cost you when it comes to venue vs. home wedding. What I tend to find is that banquet halls, not all of them but the majority have set packages. Pick two of these 4 entrée choices, 4 passed appetizers, and one stationary table of crackers and cheese and it will cost you this much. You can always upgrade and add another app, or another entrée from their list but of course this is a different higher priced package. Now it is true that some cooks at venues are willing to create something off the list but it isn't typical, or it will cost you a great deal more. I do give a lot of credit to certain venues because they have worked to create packages that are fresh and creative compared to what they use to serve. One of the perks to a set venue is that you aren't renting chairs, tables, china and linens usually. Though you should ask how much of your per person price is for those items and how much honestly goes towards the food. I think it is a good thing to know. Now when you work with just a caterer who comes to your home, if you pick the right type of caterer you have a lot more control over the type of food you will be serving. With the right company, they can create a menu around your culture, certain loves, and allergies while staying within the budget you give them. Things to remember are that you may be adding to your rental fees, staffing fees and even travel fees at times. Make sure in your contract it is written out in a way you can understand, let them break up the food cost, staff cost and taxes and such. One of the things I love is that you are honestly creating a menu that is your own. No one else is really ever going to have the exact same menu. I need to say a few of my favorite caterers are Hop River Cafe and Gourmet Galley. The food is amazing and they are cost effective without letting your guests know you were being cost effective. Things to ask your venue and or your caterer is how much local food do they use, how creatively can they display your food, and what do they do with the left overs?? You should always have a tasting, no matter what. It may sound good on paper but it may not taste good or look good. These are just a few things to ask and find out for yourself. Having knowledge of knowing how the funds are being used will give you peace of mind. That fact doesn't depend on if you use a venue or a caterer. Wedding day has come and gone and I often find that my couples say it happened so fast. They swear we just started planning, discussing colors and picking dresses. Then the next thing is saying "I do", feeding each other cake and dancing the night away. What happens in between can seem like a blur. Most them attempt to calmly await their wedding photographs and it can be seem like forever to most couples. When they finally do see the photographs, they are often reminded of great moments. Some of course that they never saw, so now imagine if you had a movie of your wedding day. I've had the pleasure of seeing the difference between videography and cinematography thanks to DL Video Productions. David Long, the mastermind behind DL Video Productions, not only loves what he does, he also has the talent to go along with the passion. Recently my booth was next to his booth at the CT Spring Bridal Event and I spent time watching his movies. They were amazing to watch, at times I couldn't look away. It was missing the older style of videography, with fades, flashy graphics and things that end up being distracting instead of adding to the movie. David makes a point to capture the day without invading the day, which is a preconceived notion for many, there is no CAMERA in your face or bright lights. David uses the natural light, and nothing is staged. He may recommend that a couple move towards a part of the venue that has great windows or a spot to have a private moment but this is only to high light the beauty of the day. Check out David's favorite movie so far...I'm sure it wasn't easy to pick. I know I wasn't able too, hence the reason I made him pick. :) Heather & Bobby's Winter wonderland wedding is breathtaking to watch. There are more to see on his blog. It is worth joining his page on Facebook as well because David hosts Open Houses. This is a chance to come meet the crew, see what they can do and of course receive a discount. They are about to have OPEN HOUSE WEEK!!! Bridal Open House at their Studio in Wilbraham MA - Go learn more about their Cinematography style and their packages. David and I are working on an upcoming event, details to follow soon. DL Video Productions will of course be at our Fall CT Bridal Event in November too. Our clients all know how to reach me, via phone, email, text and in person. We love offering them the comfort of having a wedding professional they can reach any time. I love taking a stressful moment and being able to give them an answer that relaxes them. 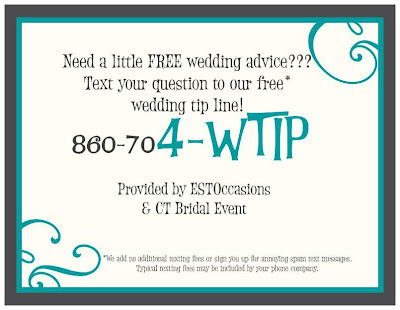 Now for the time being we are offering a free wedding tip line! That is right, a quick resource for you during your planning. The WTIP (wedding tip) Think, you are standing in the bridal shop, reading your contract and you have question. TEXT us! Or maybe you have a bridal party issue, and need the best way to handle the issue, TEXT us! Don't know what to have your reader read during your ceremony? TEXT us! Simple, free and think of it as having a wedding planner in your pocket! Thank you to ESTOccasions & CT Bridal Event. Remember normal text fees apply due to your own phone company service. We add no fees, and we of course don't spam text. One free tip for each phone number.